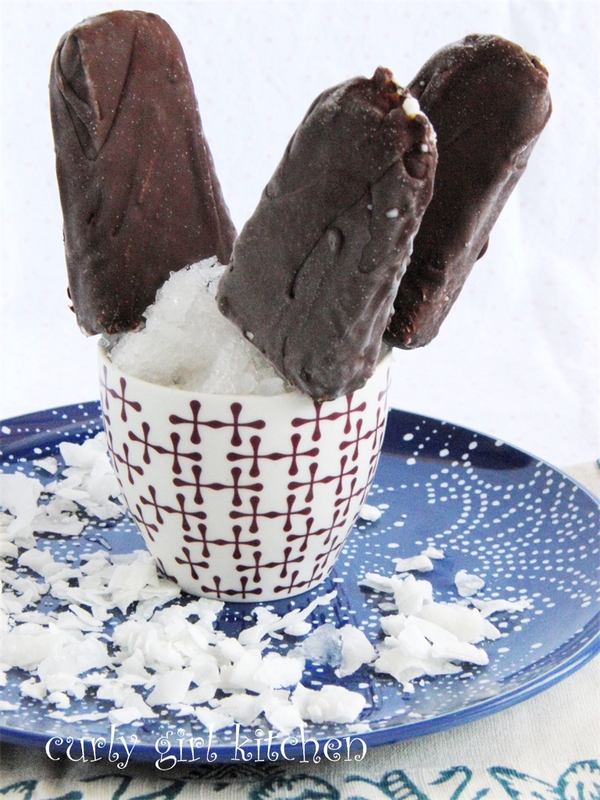 When I first started imagining this ice cream bar, I had originally planned to make a coconut popsicle with maybe some chunks of tropical fruit like pineapple and mango. 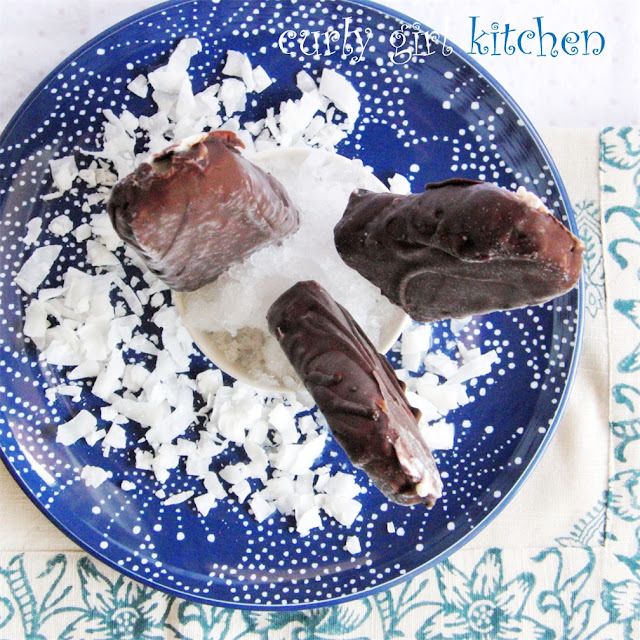 That idea then transformed into one for a coconut ice cream bar, which I was hopeful would turn out creamy and luscious even without using an ice cream maker. And then, since I've been ignoring chocolate a little this summer with all the beautiful stone fruits and berries stealing the attention, I thought I might dip the ice cream bars in chocolate. 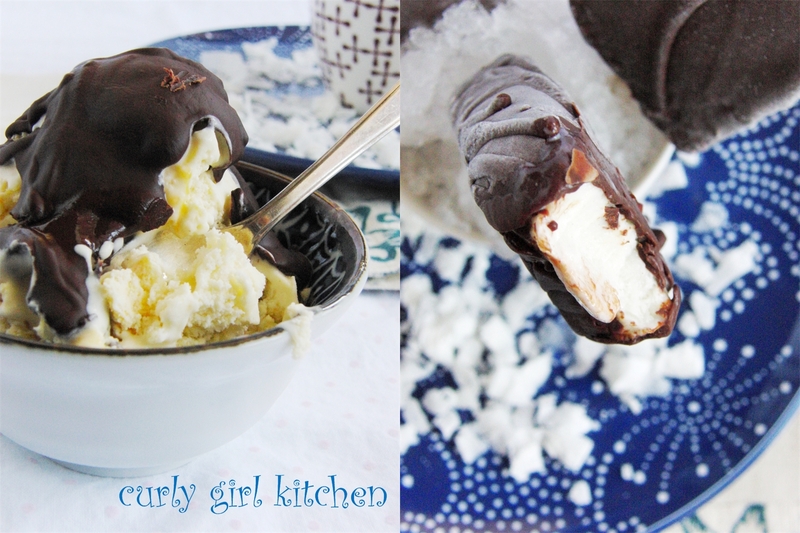 What I didn't even realize was that I was mentally creating something that would end up tasting just like a Mounds candy bar, in ice cream form. I loved that this recipe didn't require a bit of cooking, is easily made without an ice cream maker, and only takes a few minutes to assemble, with most of the time spent just letting everything hang out in the freezer while you wait impatiently for it to be ready to eat. When you bite through the hard, dark chocolate shell (which is - did you guess yet? - a recipe for homemade "Magic Shell"!) 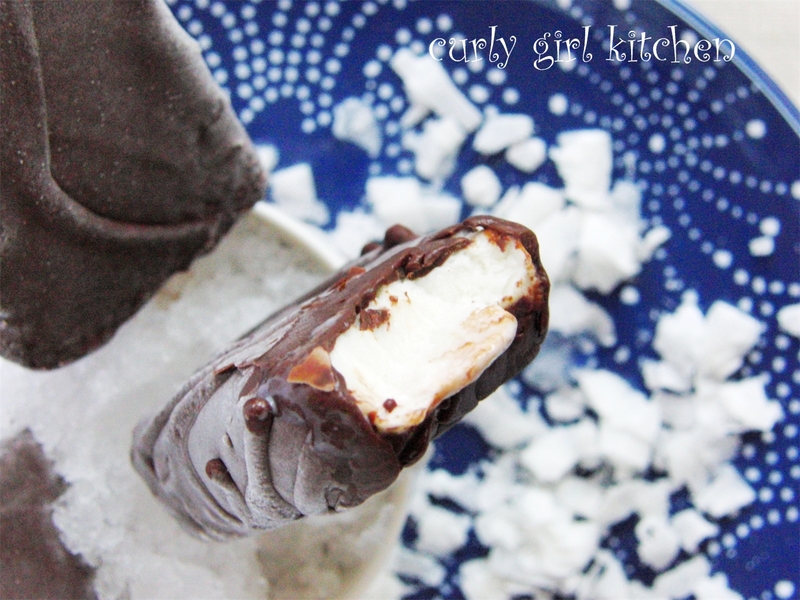 to reveal the creamy coconut ice cream inside, you might even think you're eating a frozen Mounds bar! The jingling tune that the ice cream truck played, letting us know it was coming down our street, always sent my brother, sister and I running to my mom, begging for ice cream. I don't actually remember ever getting to buy any from him, although I'm sure there was a time or two, but I think if he had been selling these Mounds ice cream bars, my mom would have had a hard time saying no. In a blender, combine the coconut milk, sweetened condensed milk, shredded coconut, vanilla and coconut extracts. Blend for 1 minute. Pour into popsicle molds (I have the "Jelly Belly" brand, and this was enough to fill 10 molds). Place molds in the freezer and freeze for 1 hour. After an hour, insert popsicle sticks, then freeze until firm, at least 4 hours. To make the chocolate coating, place the chocolate and coconut oil in a microwavable bowl; the oil will be solid at room temperature. Microwave on high for 30 seconds. Stir, then microwave for 30 more seconds. Stir until smooth and liquidy. Let sit at room temperature for 15 minutes. Cook's note: I used dark, bittersweet chocolate for the chocolate coating since it's not only what I prefer, but is more reminiscent of a Mounds candy bar. For a more traditional Magic Shell chocolate to pour over ice cream, use semi-sweet or milk chocolate instead. Carefully unmold the ice cream bars from their popsicle molds; if they get too soft, place on a baking sheet and stick them back in the freezer for a few minutes. To coat the ice cream with the chocolate, I tried dipping them, but found that didn't work well. 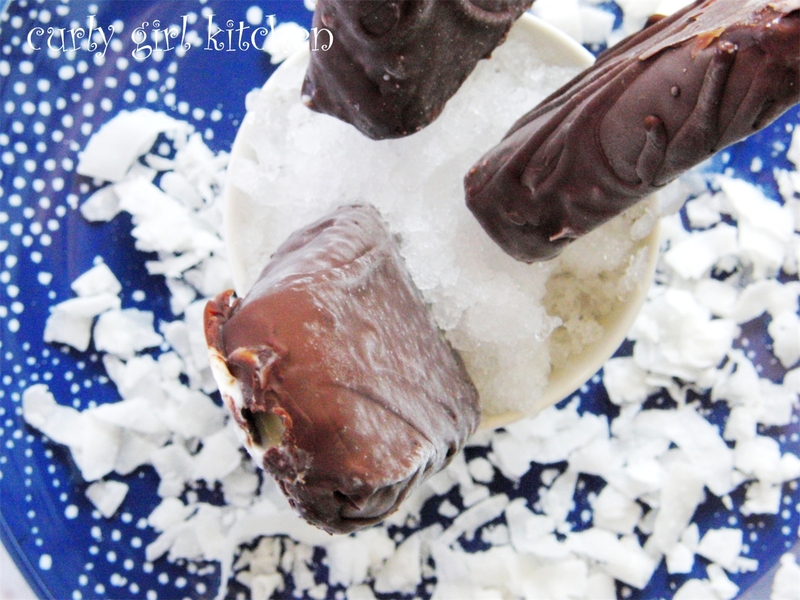 The easiest way to coat them was to hold the ice cream bars by the stick over the bowl of chocolate coating, and spoon the chocolate over the ice cream, letting the excess run off. You will have to work quickly; this chocolate coating is the equivalent of "Magic Shell" and will harden as soon as it touches the ice cream. After letting the excess chocolate run off, place the ice cream bars on a baking sheet lined with parchment paper. Repeat with remaining ice cream bars and chocolate. Freeze for one hour before serving. Store any leftover ice cream bars in a tupperware container in the freezer. If you have leftover Magic Shell, store in a glass jar at room temperature, rewarming gently before using if it solidifies. Yields 10 ice cream bars.